We are a local Melbourne Company situated in Nunawading, that has many years experience in the blind industry. Our ‘Bi-fold WeatherwallsTM‘ are a system which we guarantee for 10 years or more. We source our quality materials and hardware from Australian Local and National Companies, which means to you -the customer – buy a quality Australian manufactured product. Elite Bi-Folds & Weatherwalls™ are an aluminium extrusion which is custom made to the size of your area, in a color of your choice. We then fit the membrane of your choice, to the frame, either PVC, Vistaweave mesh, fly wire, or Acrylic Sheet. Ask Dean about our new exciting membrane ‘Crystal Clear’ with a 15 year guarantee launched in 2014. Our panels can be fitted with the below inserts, including PET DOORS, if required. 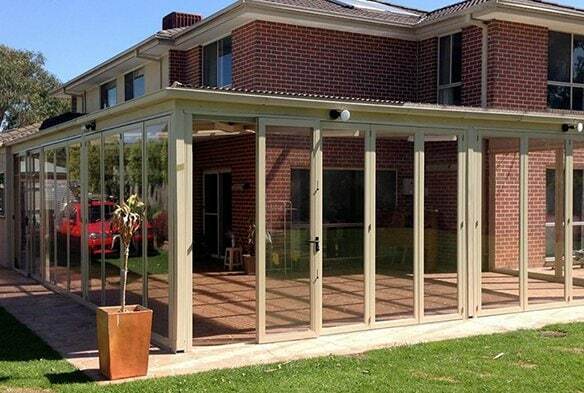 Our very own 'Crystal Clear' membrane with a 15 year guarantee which has the clarity of glass.